Panasonic is to bring the Winter Olympics in 3D to a lucky few, with the company setting up two Full HD Theatres in LiveCity, Vancouver where the games are taking place. Opening from 12 February the theatre will be packed with a 103-inch Full HD 3D and shots of the Opening Ceremony, highlights footage of the 2010 Winter Games and, bizarrely, Sarah Brightman performing Panasonic's song, Shall Be Done. We're hoping the dream mentioned isn't the one featuring Cheryl Cole, champagne, fondue and Barry White's dulcet tones emanating from the stereo. As that – even in 3D – would just be wrong to share. Anyway, enough digression, Panasonic says about the new Full HD Theatre: "This theatre is our way of sharing the passion of the 2010 Winter Games with Vancouver residents and visitors from around the world," says Takumi Kajisha, Managing Executive Officer, Panasonic Corporation. 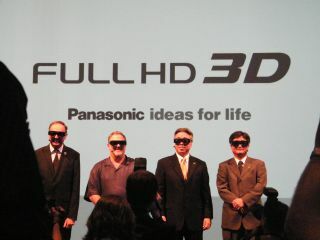 "Panasonic believes 3D systems will greatly enhance at-home viewing of future Olympic Games, combining the enjoyment of watching the greatest sports event with the stereoscopic images of full HD 3D." Panasonic isn't the only tech company to get in the Winter Olympics' act. Google recently unveiled its Street View service will be showcasing images from the event. The Winter Olympics Event that is and not our own Cheryl Cole/Barry White dreamlike medley.